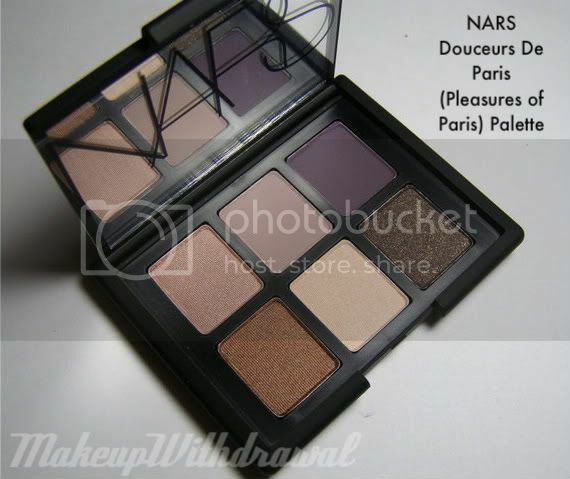 Mr. MakeupWithdrawal surprised me with a present for no apparent reason- the NARS palette that I had craved greatly! 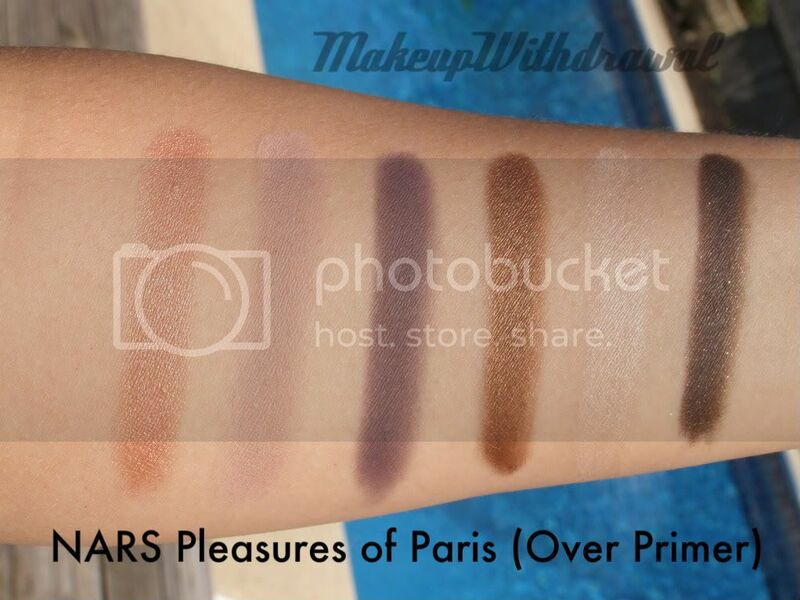 I actually didn't think that it was available anymore, but the 9951 Pleasures of Paris Palette is still on the Saks Fifth Ave site (as some sort of exclusive I guess). His only stipulation is that I'm not allowed to gush about it to him. Anyways, I was super happy to get because I felt like all the shades were very versatile and very well coordinated. I could pick any 3 shades and create a look out of them, the possibilities are endless! Left to right: Nepal, Violetta, Demon Lover, Fez, Abyssinia and Cordura. Nepal is a soft pinky-peachy tan. Violetta is matte light violet with enough grey and brown in it that it's very neutral. Demon Lover is a dark, greyed violet matte. Fez is a shimmery warm brown. Abyssinia is a vanilla satin, with a bit of frost. Cordura is a dark cool bark brown with golden micro glitter. As you can see, a primer (Urban Decay Primer Potion was used here) really intensifies the color. Without it, the colors smolder instead of being vivid. I love how well these shadows blend, really. It's so easy to transition one shadow to another. I think this palette might be my new "If I was stranded on a island and could only have one palette to beautify me for the rest of my life"-palette (a position previously held by one of my LORAC palettes). I mean, the color combinations you can get with this are so varied, you could use this palette for 99.9% of all occasions. I'm in love! And I'm quite thankful that Mr. MakeupWithdrawal got this for me, what a lovely gift! Palette is $55 at Saksfifthavenue.com. Each shadow is 1.4g. Does anyone else have this palette? Or any of the shades in it? Product shown was given as a personal gift. 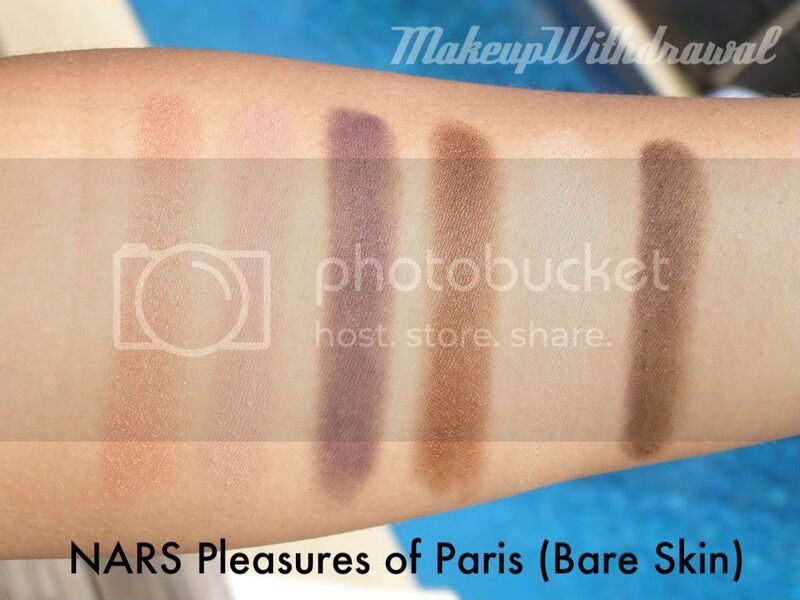 Nice palette all the colors are so beautiful perfect for simple everyday look,hope to see EOTD soon.